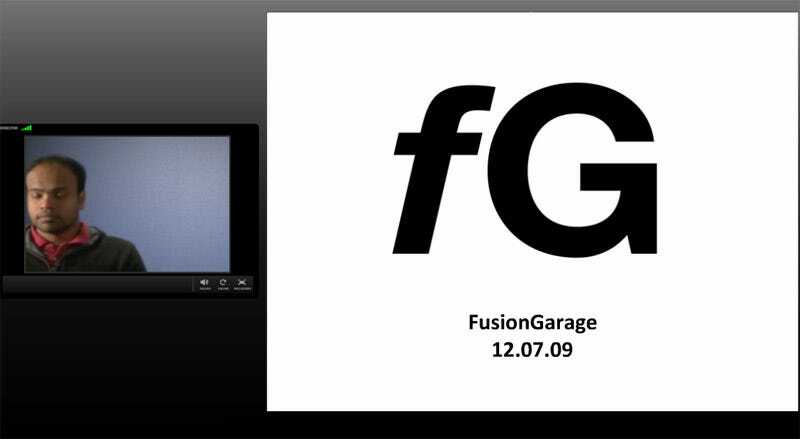 Fusion Garage, the engineering side that booted TechCrunch off of their own Crunchpad project, is about to be unveiled in a live webcast. We're going to be liveblogging it at 9:30 AM PT (12:30 PM ET). That's basically now. 9:22: The stream was active for a second—I got a screencap of it above—but it looks like they shut off the video. 9:23: In case you're not familiar with the story, hit up this link while the webcast is still preparing, and check it out. Basically, Fusion Garage, on behalf of their shareholders, decided that they wanted to cut TechCrunch out of any involvement (besides a crappy advisor role) after the two parties had developed the thing together. Think of it as if your wife one day told you that she'd be raising your kid by herself, and your involvement was no longer needed. 9:28: It's sad, really, since the CrunchPad was supposed to be one of the first (if not the first) cheap tablets that was designed just for web browsing and "consuming" content. The perfect bed/toilet computer, essentially. 9:29: I mean, even if it does end up being released under a different name by Fusion Garage without TechCrunch's involvement, would you buy it? Or would you be loyal, in principle, to TechCrunch, since they're the ones who actually came up with the idea? 9:30: It's a tough decision. Would most people care about petty stuff like this if the final product was good? Would most people even KNOW about it? Probably not. 9:31: Though, we'll get to hear FG's side of the story today. Who knows if TechCrunch's side was the entire truth. It'll probably end up being somewhere inbetween. 9:34: It's starting. Chandra is saying this webcast is a good way to address misconceptions introduced by Arrington's TC post. 9:36: "I'm a dreamer of big dreams." And he's a engineer. 9:36: Chandra is going over his past as an engineer. He's saying he's upset by all the posts on him from the last week. 9:37: "Fusion Garage is the only actual do-er in this story." 9:37: Since 2008, they tried to make a browser-based operating system that supported a "thin, tablet-like touchscreen device." 9:38: In his first meeting with Arrington, he explained what FG was developing, and how his OS would be the key to making the "vision a reality". Mike Arrington would introduce them to investors, secure funding and introduce them to hardware vendors. He would want to make a deal so TechCrunch could acquire the company so that Mike would have controlling interest. They had many talks about the acquisition, but nothing solid ever came out of it. 9:40: Mike was "unable to deliver", in February 2009. Without further development, including a finished prototype, nobody would provide funding to bring a product to market. He then takes a shot at the birthday cake photo. 9:40: "If the project was going to go forward, it would be up to Fusion Garage. It was clear that Michael was not able to deliver." 9:40: They finished their hardware prototype, and did all the engineering challenges by themselves—as you'd expect. 9:41: Chandra said that he secured funding through "his" network, instead of through Michael Arrington. It seems like this might be the thing that triggered the booting of Mike—the fact that TC couldn't deliver funding or connections. 9:42: Chandra is saying that there was no agreement for an acquisition by TC. There were talks, but no agreement. He's saying Fusion Garage owns all IP and proprietary rights for the production. The OS developed entirely by them. "TechCrunch didn't contribute a single line of code." 9:43: FG provided Arrington terms for being an advisor role, but was turned down. 9:44: The product will be introduced this week. And they call it Joojoo. 9:45: The reason why they call it Joojoo was because it's an "African term that stands for magical"
9:45: The device boots in 9 seconds. 9:46: All icons on the site are "web services", and the screen is really really green. 9:46: You can get online, to the internet, in 9 seconds. 9:46: It has a 12.1-inch capacitive touchscreen. "The largest screen of any device in its class on the market." 9:47: No physical buttons other than the on-off buttons. 9:47: Joojoo has no preloaded applications, Windows or menus. It will accept sliding and scrolling gestures with your fingers. And it can be used as a digital book. "The internet is the application", similar to Google's Chrome OS. 9:48: "Unfortunately Arrington's dream of $200 or $300 price for something like this was unrealistic. Nothing worthwhile can be delivered to market at that price." How are they pricing it? 9:48: The Joojoo is more than 3x the iPhone 3GS's screen. How about netbooks? Those have "noncapacitive touch and a poor web experience". 9:49: Joojoo "provides the best in class internet experience for everything we do." And it can "watch full HD videos," as well as read magazines and books. It weighs 1.1 kg. 9:50: It's going to be $499. 9:50: Preorders are available this friday on the Joojoo website. It'll be sold online only, without retail until the near future. 9:50: Q: "Please respond to Arrington's post." 9:51: A: "There is no legal case filed today. We are very confident in our position, and we believe we own all the IPs." 9:51: A: There are no contracts of any kind between us and TechCrunch. 9:51: Q: "What do you say to Michael saying you ambushing him out of the blue." 9:51: A: Chandra says, basically, Arrington failed on everything he promised he would do (funding, getting connections), so FG had to "move on on their own." 9:52: Q: "Other companies have tried to introduce tablets to the market and failed. Why is your device different?" 9:52: A: Tablets today run the full Windows operating system. They're expensive, and heavy, and it wasn't a form factor that could deliver the way you would like to use. "We believe we can make a big difference." Then he goes over the features like a 12.1-inch screen and the fact that they "don't boot to an operating system." 9:53: There have been verbal discussions about a possible acquisition, but "nothing was delivered on Michael's part." There weren't any verbal assurances, except for Michael saying that he wants to acquire the company. 9:54: Q: "What exactly was the offer you made to Michael that he refused?" 9:54: A: "Michael promised a lot of things, but he did not deliver. We offered the possibility to work with us, and be part of this. Despite us doing everything, software, hardware, funding. But Michael turned down the offer." 9:55: Q: "Can you comment on Google Chrome OS." 9:55: A: "They see things in relation to Netbooks, but we believe that Netbooks' use cases aren't what they should be for what you want to do." 9:56: Q: "What kind of offline capabilities does the machine have?" 9:56: A: You can use your Gmail, for example, using a local cache. You'll synchronize when connectivity is available. 9:56: Q: "Does this product have any real chance to succeed without TechCrunch's marketing?" 9:57: A: If you define marketing as doing a blog post, then no. Michael has been "talking about this for the longest while." He really wants to hammer home that Arrington didn't deliver on any kind of promises. 9:57: Q: "What are the specs?" 9:57: A: "It has a 12.1-inch screen, 4GB SSD, but most of the storage is stored in the cloud." 9:58: Q: "The screen was extremely green. Is that normal?" 9:58: A: "It's a trick of the camera. I'll show this in 1 to 1 demos, and the screen is fine, and the colors are fine." 9:58: Q: What is the battery life? 9:59: A: 5 hours. Wi-Fi only. 9:59: Q: Do you have any relationships with content providers? 9:59: A: No. We're in discussions with companies. 9:59: Q: Will there be any Joojoo accessories? 10:00: A: Yes, we'll announce them in the next couple weeks. 10:00: Q: Will we be showing complete demos in 1:1 meetings? 10:00: There will be one color at the moment. 10:00: "We think there will be a lot of demand for this product." 10:01: Fusion Garage has raised 3 million to date since 2008. 10:01: "Thank you so much for your time today. I look forward to seeing many of you over the coming weeks." 10:01: That looks like the end. I'll be getting a hands on with this thing as soon as possible, so check back for that.